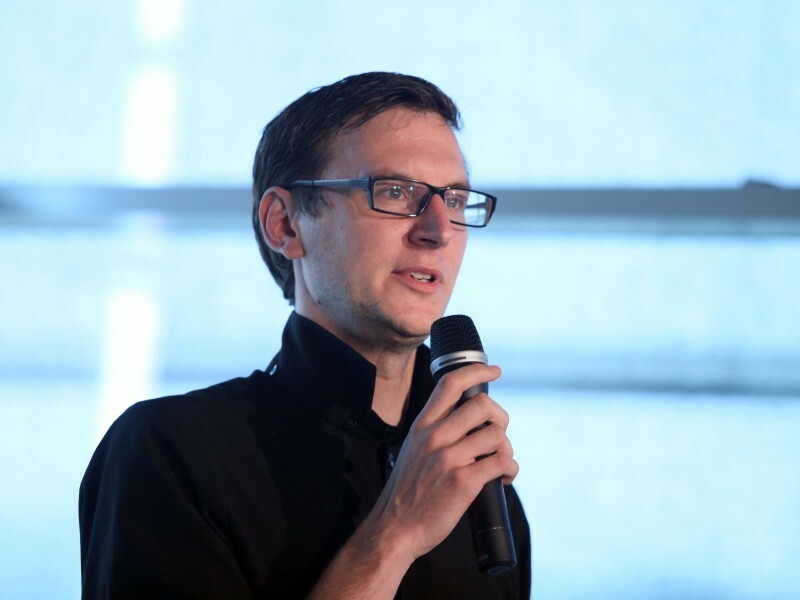 Christopher Lindinger, co-director of the Ars Electronica Futurelab, was one of the architects of Linz’s UNESCO City of Media Arts initiative and the lead author of the application for admission. He gave this interview on the day it was announced that Linz had been accepted for membership. Christopher, we Linzers have good reason to be proud of ourselves today, but we especially want to congratulate you and the team that managed the application process. It’s marvelous that Linz has been honored with this title! Christopher Lindinger: I was absolutely delighted when the good news from UNESCO finally arrived yesterday morning. I mean, I knew that the jury would reach its decision in late November, early December, so in the last few days I’ve just been dying of curiosity and checking my mailbox constantly. When the decision was announced, literally hundreds of congratulatory e-mails started flying back and forth among the people who worked on the application last year. In addition to Ars Electronica, the city’s Director of Cultural Affairs, the Creative Region headquartered in Tabakfabrik, Linz Art University, the OK Center for Contemporary Art and many other institutions played key roles in the application process. So, what benefits can we expect from this title and the admission to the UNESCO Creative Cities Network that goes along with it? Christopher Lindinger: Admission to UNESCO’s Creative Cities Network is reserved for cities that can demonstrate outstanding achievements in the fields of literature, film, music, handicrafts, gastronomy, design or media art. To date, this honor has been bestowed on only 69 cities worldwide, including metropolises such as Buenos Aires, Bilbao, Shanghai, Berlin, Helsinki and Tel Aviv. Now Linz has joined this select company and is authorized to use the title and the UNESCO logo on its official letterhead. The mission of the UNESCO Network is to strengthen the cultural identity of each titleholder city, which means a lot for the standing of local protagonists working in artistic fields and cultural institutions, but this will also have a significant positive impact on, for instance, cultural tourism. Plus, UNESCO actively fosters networking, exchange and creative collaboration among the individual Creative Cities. It can well be expected that Linz will exert an even stronger attraction on international audiences in the future. Why do you think Linz prevailed against so many competitor cities? What, in your opinion, were the factors that really convinced the jury? Christopher Lindinger: It’s been mentioned over and over again that Linz has undergone a truly impressive metamorphosis over the last few decades from a city where heavy industry prevailed to a center of culture and high-tech. But, in this connection, it’s important to point out that, already in the late 1970s, decision makers in Linz displayed great perspicacity and openness to social and artistic issues in connection with a device that large segments of the population were still totally unfamiliar with: the computer. The first Ars Electronica Festival, the first Visualized Klangwolke were staged back in 1979. It’s precisely because no other city was an earlier adopter than Linz when it came to focusing on the interrelationships among technology, art and participation by the general public, and this is why so many creative individuals, high-tech explorers and guests here in Linz were never only commentators on what was happing at the leading edge; they were also trailblazers delivering relevant input to the technological revolution that has long since made the internet, social media and other digital tools parts of our everyday life. Tim Berners-Lee, the man considered the inventor of the World Wide Web, was singled out for recognition by the Prix Ars Electronica in 1995 for his hypertext concept, and that was the first prize that was ever bestowed on him for it. With the Ars Electronica Center built that same year, we created something unique: a Museum of the Future. And the Ars Electronica Futurelab, our in-house R&D division, made Wired Magazine’s list of the world’s Top 10 media labs. And there’s lots, lots more—for instance, Ars Electronica’s digital archive, which constitutes the world’s largest repository documenting the genesis and development of the cyberarts, and Linz Art University with its strong intermedia program. Or consider Linz personalities like VALIE EXPORT, who’s regarded as one of the icons of media & performance art. But another factor that was surely decisive for the jury is the tremendous creative potential that’s emergent in Linz. I mean, all you have to do is take a look at the Tabakfabrik. The transformation process that’s underway there now—a tobacco production facility morphing into a hub for creatives, designers, hackers and makers—is a best-practice example of innovative urban development that’s garnered attention worldwide. And now that we’re City of Media Arts—can you give us a preview of some of Linz’s future plans? Are there special initiatives and assignments that Linz will now be involved in? Christopher Lindinger: Definitely. There are new agendas and plans that are oriented externally as well as those that will be implemented here in Linz. Externally, we are called upon to get actively involved in UNESCO’s Creative Cities Network. As previously mentioned, Linz has gone through a highly acclaimed transformation process in recent years. With the experience we’ve gained thereby, we can set a good example for other cities, inspiring and advising them. With the other cities that have earned the title City of Media Arts—Sapporo, Tel Aviv, Dakar and Lyon—we aim to further intensify the collaboration and good contacts we’ve maintained for many years—for example, in the form of exchange and residency programs. That’s why we’re already planning to stage a network get-together of all UNESCO Cities of Media Arts in conjunction with the 2015 Ars Electronica Festival. In Linz itself, we want to concentrate on implementing so-called branding measures to solidly anchor this very valuable designation in the image the city projects. One option that immediately suggests itself would be development of a corresponding media arts tourism package. Plus, we want to more effectively showcase some of the media art treasures we’re blessed with here in Linz. One suggestion has been to establish a VALIE EXPORT Center in which part of the artist’s oeuvre can be presented to the general public and also be made available for research purposes. And needless to say, we plan to launch initiatives to integrate Linz’s very vibrant art, culture and creative scene. Cultural Affairs Director Julius Stieber announced the formation of a City of Media Arts Executive Board that will include you, Patrick Bartos, CEO of Creative Region Linz & Upper Austria, and Gerda Forstner, director of the Municipal Cultural Development Agency. How do you define this new role? Christopher Lindinger: As an executive board, we’ll serve as liaison with UNESCO, the other cities in the Creative Cities Network and media outlet representatives. On the other hand, we’re the go-to guys for representatives of Linz’s creative economy, for artists and tech-nerds. We’ll make every effort to interlink protagonists in this city, to bring them together for meetings to discuss how we can strengthen the symbolic value of the UNESCO title in the coming years by means of concrete content and measures, and also how we can nurture lateral thematic interconnections among urban domains such as education and tourism. In going about this, the concrete projects definitely don’t all have to be elaborate undertakings like the VALIE EXPORT Center; equally desirable are small steps, catalysts that trigger some novel sequence of actions and reactions—for instance, enabling a Linz media artist to spend an inspirational sojourn in Tel Aviv, or bringing in his/her Sapporo-based counterpart for a workshop in Linz.